Add to My Calendar 04/20/2019 12:00pm 04/20/2019 2:00pm America/New_York The Easter Bunny is coming! Hop on over on April 20th - The Easter Bunny will be at Reynolds from 12-2:00 pm! Bring the kids in for a little Easter treat, and a chance to win an Easter Décor basket valued at $75.00. 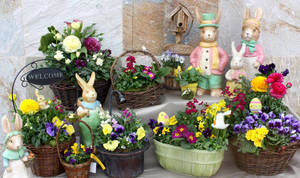 We will be showcasing beautiful Easter blooming baskets perfect for everyone on your list. St. Francis Community Center Counseling Services announces a group for Adult Survivors of Sexual Abuse and Assault. Empower yourself – unlock the skills and tools necessary to move forward and thrive in this safe, free and confidential group. St. Francis Community Center is celebrating 43 years of good health and community support by hosting the Family Health and Safety Fair on Thursday, April 25, 2019 from 10:00 AM to 1:00 PM in the St. Francis Community Center Gym, 4700 Long Beach Blvd., Long Beach Township, NJ 08008.